If ever there was a time the need for insurance has been in the spotlight, it’s in Nebraska in March 2019. Although it would be ignorant to suggest it would take care of all your problems, a flood insurance policy could help make a difference at this point in time. That should cause you to stop and think: What other needs do I have that insurance could help with year-round? No one likes paying for insurance, but no one can deny its worth. And that’s the crux of the matter. Are you willing to take the risk without it? More vehicle insurance beyond the state-required liability could help if you hit one of those Nebraska-size potholes. And did you know Nebraska is 13th in the nation for “most car accidents,” according to World Atlas 2017 records? Not to mention the Insurance Institute for Highway Safety reported 228 vehicular deaths in Nebraska in 2017. That brings up another insurance need. No one wants to think about death, but no life insurance policy just adds to the mountain of issues your family will face alone. What about homeowners insurance—we’re into spring, complete with hail, falling tree limbs and possible tornadoes. You get the picture. But how do you know how much and what kind of insurance you need? It can be confusing. That’s when you need someone to trust. Someone who will help you figure it all out. 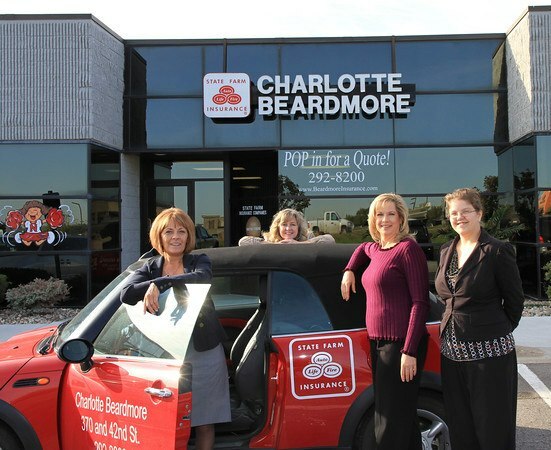 Meet Charlotte Beardmore, Insurance Agent. Charlotte is a native Nebraskan, so she knows what you live with and how to help you. She started her business at a time when women didn’t sell insurance—she and one woman in Council Bluffs were the only female representation in the metro, and they paved the way. But she was determined to build her business and do something that helped people.